When NASA launches “AMS-02” on Feb 27, 2011 at 4:04 PM Eastern. 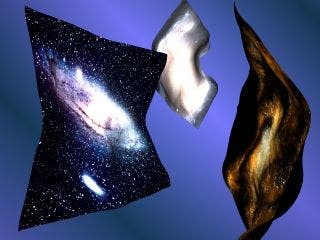 Sam Ting Principal Investigator for the Alpha Magnetic Spectrometer-2 experiment hopes that it will provide data that proves the existence of parallel universes that are composed of anti-matter -discoveries could prove verify theories and answer basic questions regarding how the universe formed. A cosmic snake appears to slither across the plane of our Milky Way galaxy in this image from NASA's Spitzer Space Telescope. The snake-like object located about 11,000 light-years away in the constellation Sagittarius is actually the core of a thick, sooty cloud large enough to swallow dozens of solar systems and may be harboring beastly stars in the process of forming. NASA mystery footage. If this is space debris, why is it leaving the planet instead of circling it? What do you think? For the first time, NASA's Spitzer Space Telescope has detected little spheres of carbon, called buckyballs, in a galaxy beyond our Milky Way galaxy. The space balls were detected in a dying star, called a planetary nebula, within the nearby galaxy, the Small Magellanic Cloud. What's more, huge quantities were found — the equivalent in mass to 15 of our moons. One of the most dynamic and intricately detailed star-forming regions in space, located 210,000 light-years away is the Small Magellanic Cloud (SMC), a satellite galaxy of our Milky Way shown below. At the center of the region is a brilliant star cluster called NGC 346. Energetic outflows and radiation from hot young stars are eroding the dense outer portions of the star-forming region exposing new stellar nurseries. "Detecting Earth in reflected light is like searching for a firefly six feet from a searchlight that is 2,400 miles distant," wrote a panel of astronomers, when describing the challenges facing the search for other planets in the universe. But new NASA reserach shows that nearly one in four stars similar to the sun may host planets as small as Earth, according to an extensive new study funded by NASA and the University of California. Astronomers used the W.M. Keck Observatory in Hawaii for five years to search 166 sun-like stars near our solar system for planets of various sizes, ranging from three to 1,000 times the mass of Earth. All of the planets in the study orbit close to their stars. The results show more small planets than large ones, indicating small planets are more prevalent in our Milky Way galaxy.